Transparent things just seem more futuristic than normal gadgets for some reason. Maybe it’s because you can actually see all of the inner workings doing their thing, or maybe it’s because transparency means we’ve transcended the need for clunky metals, ugly silicon and cloudy plastics. 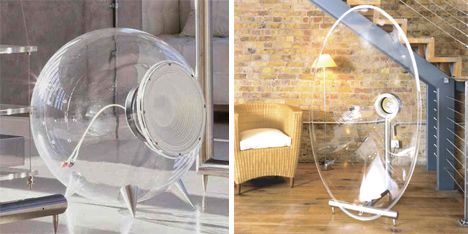 Either way, these transparent doodads are undeniably cool-looking, as impractical as some of them may be. 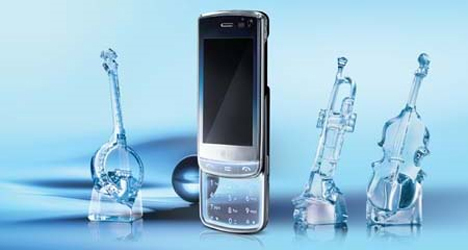 The GD900 cell phone from LG was one of the most-anticipated phones since the iPhone debuted. 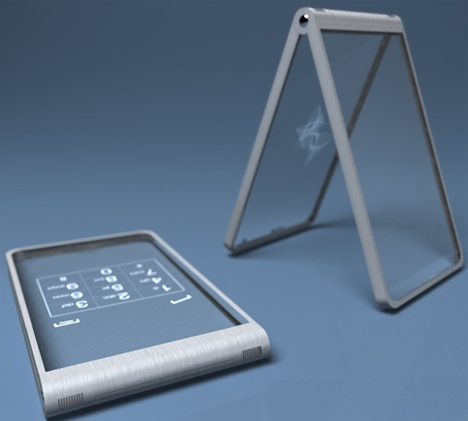 This design features a transparent slide-down keypad that looks quite futuristic. Just don’t let the hollow construction of the keypad entice you to pull some crackpot stunt like putting live fish into it. 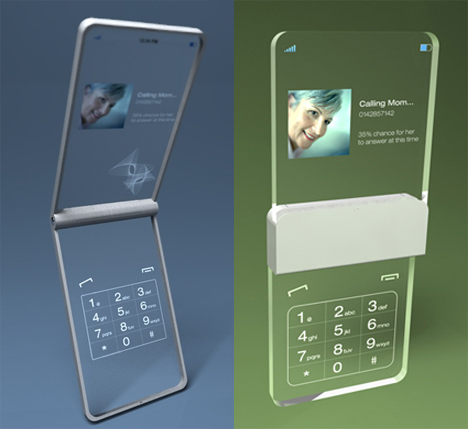 The Glassy Glassy Phone concept (in two configurations) was dreamed up by Tokyo designer Mac Funamizu. It’s far from actually being produced, but the concept is really quite beautiful. The entire display is completely transparent until the phone is turned on. Unfortunately, it doesn’t seem all that feasible; for people who drop their phones as much as we do, this thing would shatter within days – or at least be filled with cracks and chips. And the endless fingerprints would surely drive most people crazy. 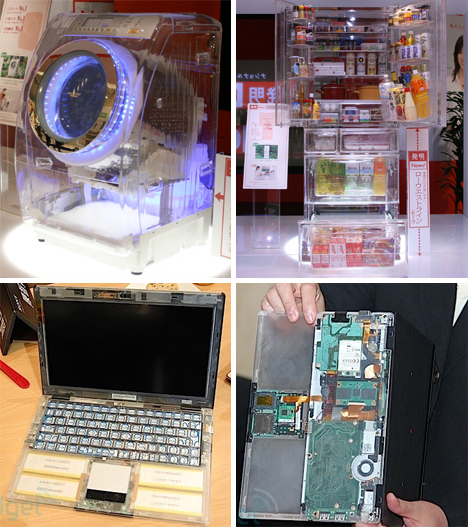 Often, transparent versions of gadgets or appliances are made just to display the item’s interior features. The above electric dryer and refrigerator were seen at an appliance show, and their purpose was to show the capacity of both. Just below that, the Sony VAIO X is displayed at a press event in China. The transparent case won’t be an option available for purchase, but was put onto this prototype for display purposes only. 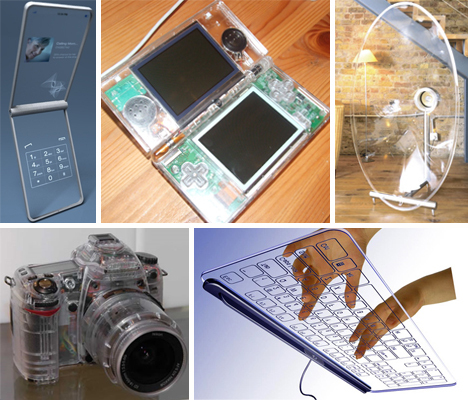 Too bad, because a transparent laptop would be pretty sweet. 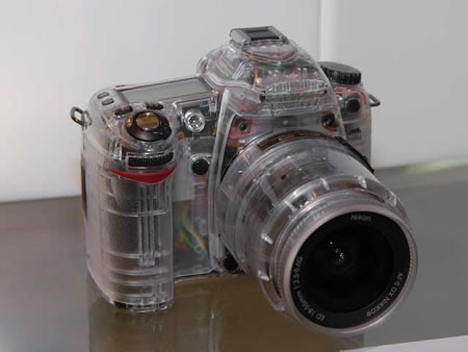 There’s not a lot of information on this transparent model of the Nikon D80 DSLR, but since it was spotted at a camera show it’s likely that it, too, is just a transparent mock-up to show off its features. But it sure is beautiful, mock-up or not. 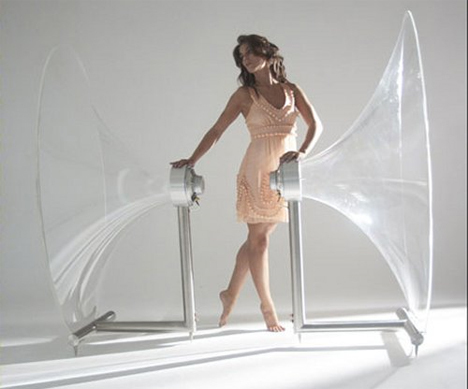 These giant transparent speakers from Ferguson Hill are called the FH001 series. They look like something you’d find in a public aquarium, and they only deliver 3 to 50 watts of sound. They are, however, made with a high-efficiency design. But at an astonishing $26,000, they’re out of just about everyone’s price range. The Nokia clear ghetto blaster is…well, it’s frankly a little weird. It’s supposed to entice people to take their music outdoors rather than just enjoying it in their homes, but does anyone really use their Nokia phone for listening to music? Regardless, the briefcase-like box has a shelf for your Nokia phone on top, two speakers below, and a sturdy nylon strap for carrying. Now you can bug everyone in the park with the newest irritating Finnish indie band. The transparent toaster concept on the left, from Osman Can Ozcanli, has been around for a while but doesn’t seem any closer to production. The concept is pretty neat: the glass gets hot enough to toast the bread, and you can see it all happening, thus avoiding the dreaded burned toast. Sadly, developers haven’t been able to get the glass hot enough safely to make it happen. The concept on the right, from designer David Chacon, seems to address that problem by adding some metal heating coils inside the transparent sides. It seems like a good compromise to ensure that your bread is the perfect shade of tan. 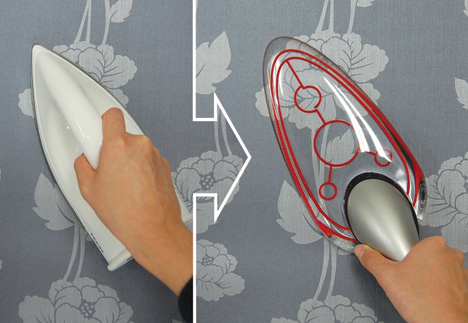 A transparent toaster would make preparing breakfast fun, but this transparent iron could actually save you time and possibly a favorite shirt or two. Conventional irons make it hard to keep track of buttons and errant wrinkles, but the B-Iron 715 concept from Dong-Seok Lee & Ji-Hyung Jung lets you see what you’re doing at all times. It’s still a concept at this point, but it seems a pretty solid idea. If you aren’t afraid of silly things like voided warranties, case mods are the perfect way to express your love of all things transparent. These case mods gave their respective gadgets entirely new looks. 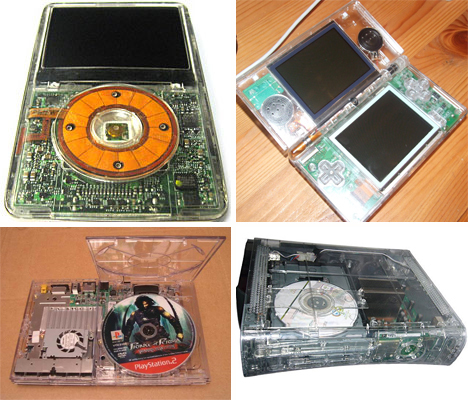 Clockwise, from top left: iPod, Nintendo DS, Xbox 360, and PS2 Slim. 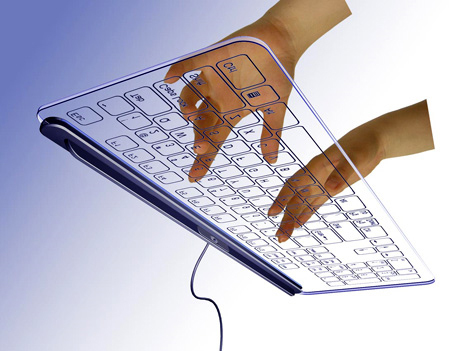 Designer Kong Fanwen had the bright idea to create a completely transparent glass keyboard. 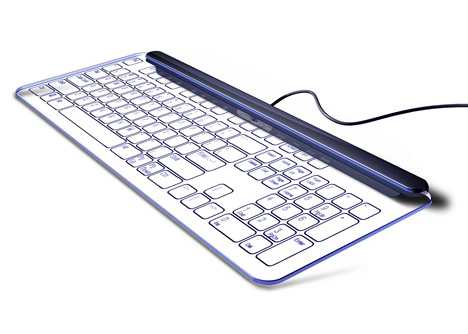 The keyboard, which is still a concept, would work with a tiny camera able to detect the movement of your fingers and log keystrokes. The keys could conceivably be programmed to make that satisfying “click” when pressed, but they wouldn’t give the same tactile sensation of being pressed. Still, if you could get past the alien feel of the keyboard, it would definitely make your desk a more attractive place. See more in Various Gizmos or under Gadgets. October, 2009.